From the sand to the ocean, camp to the pool, water parks to the playground – summer usually means high-energy for kids enjoying time off from school. It’s a good idea to keep on hand a stash of cooling, nutritious snacks to satisfy ferocious appetites and picky palates. One such snack for high energy kids is called BANANA SUSHI… Sushi is a Japanese food consisting of cooked rice, combined with other ingredients, usually raw fish or other seafood. Sushi is unique based on the preparation method and how it’s rolled up and sliced into bite size pieces. This is a unique teaching opportunity to discuss the Japanese culture and its different style of foods and eating methods. When you use this recipe, explain to the kids they will be making their own fun and tasty version of Sushi using bananas. 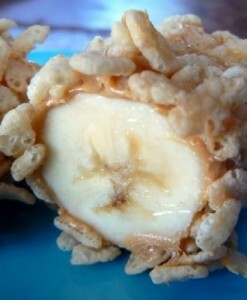 Roll in rice krispies cereal. Slice into bite size pieces (like sushi). Encourage the kids to use chopsticks and to learn more about Japanese eating utensils. •Make your own trail mix with a combination of nuts, dried fruit, dark chocolate chips, and cereal pieces. Try a selection of several healthy cereals, pretzels, nuts, and crackers. •Dried fruit – banana chips, mango, and apple, papaya, pear, or peach slices. •Plain popcorn sprinkled with Parmesan cheese or flavorful spices. •Baked pita or bagel chips dipped in cool, refreshing hummus. •Skewer cubes of firm cheese (cheddar, Swiss, Monterey Jack), alternated with chunks of fresh summer fruits. •Fresh fruit salad – Cut up apples, pineapple, bananas, oranges, and berries or any fresh, in-season fruits. Throw in dried cranberries or raisins, and sunflower seeds or slivered almonds. Top with a dollop of yogurt. •Berry parfaits – Layer fresh berries with granola and yogurt or freshly whipped cream. Of course, as you make theses treats with your 4-Hers be sure to incorporate the importance of their nutritional value to their daily intake based on the current MyPlate recommendation. You can find more kid-friendly information on MyPlate at http://www.choosemyplate.gov. The National Association of Extension 4-H Agents has awarded the 4-H agents in the Northwest Extension District of Florida their national award for Excellence in 4-H Volunteerism. This award is given to the agent or group of agents who show(s) an unequaled dedication to providing quality volunteer development programs. In our district, each county provides local volunteer training and development, but we also work as a district to bring you opportunities like our district-wide volunteer leader forum at 4-H Camp Timpoochee and district-wide shooting sports volunteer trainings in each discipline each year. While the agents are to be congratulated for working hard and receiving this award, many thanks go to our wonderful volunteers throughout the district who support 4-H programming in Florida. Every club leader, project leader, camp volunteer, fair judge, and so on, is in part responsible for the success of Florida 4-H. We are so grateful for your unwavering dedication to 4-H Youth Development. Furthermore, we invite you to continue to help us “Make the Best Better” through our Make a Difference Monday’s volunteer training series. The series will begin August 19, 2013 and will run the third Monday of every month through April 2014. Your local extension office will be able to provide you with further details including topics for each session in the series. 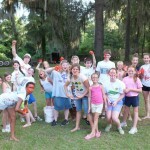 Youth enjoy 4-H summer camp because it provides a welcoming environment where they can learn and grow. They get to make new friends and participate in activities like, archery, swimming, canoeing, rocketry, kayaking, arts and crafts, and more. When they come home from camp singing camp songs and relating their awesome experiences, they encourage their friends at school as well as fellow club members to come with them during the next year. With this in mind, how can club leaders and other volunteers encourage youth to participate in camp if they have never attended or have never considered attending? Include fundraising percentages or credits given to members who participate in and plan club fundraisers. Maybe 10% of the funds they raise for the club in a particular fundraiser will go to their camp fees, etc. You may offer full or partial scholarships to youth who demonstrate leadership or take on an officer role in a community club setting. Allow 4-H members who turn in a completed and well-produced project book to be rewarded at the awards banquet with a camp price reduction or prize to be used in conjunction with camp attendance such as a club t-shirt or goodie bag with camp related items. 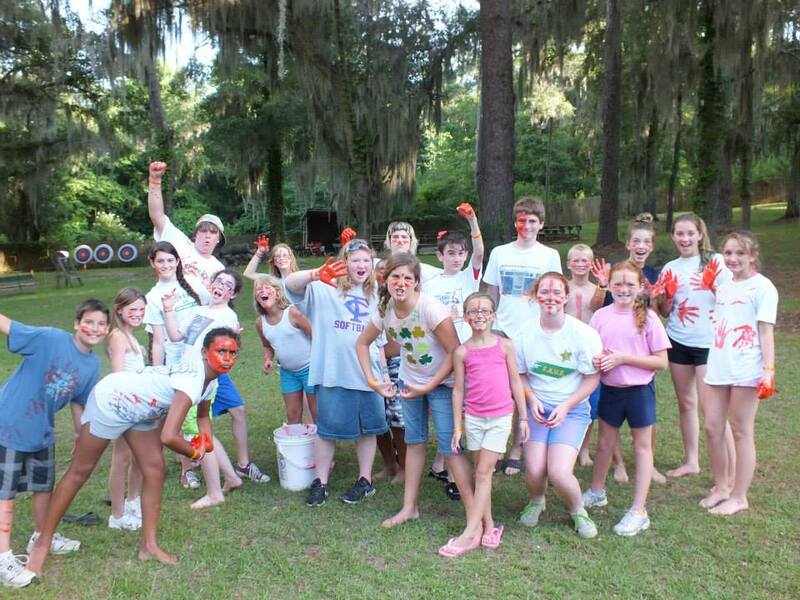 While funding for camp can introduce challenges for some club members, these obstacles when handled appropriately and quickly can provide terrific learning opportunities for youth who earn their way to attend camp and have a wonderful experience while there.